She's one of Disney's classic princesses, so it's no wonder young girls everywhere clamor for Cinderella toys. 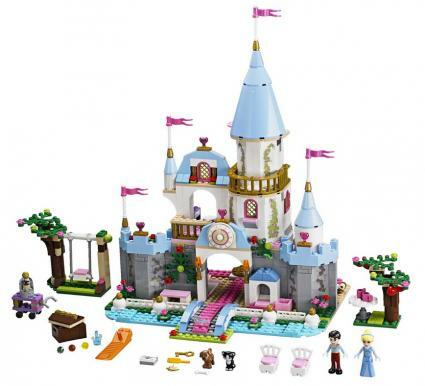 When it comes to her castle playsets there is a huge variety of styles, accessories, and target age groups to choose from. The Lego Cinderella Castle comes with the pieces to build a beautiful castle that looks like the one found at Disneyworld. It is recommended for ages five and up and costs about $80. 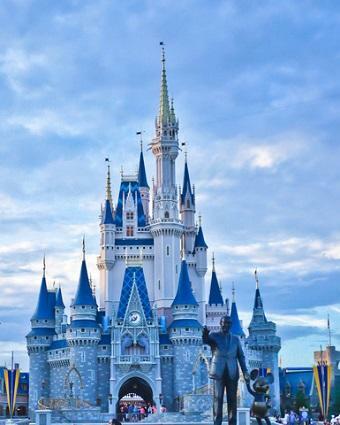 The size of the castle is about 14 inches long, 15 inches wide and 4 inches high. It is recommended for ages five and up. The set contains small pieces that present a choking hazard, so is not recommended for households with small children.The castle also comes with a locked treasure chest and a key so your child can explore all the contents of the chest, such as a royal crown. The inside of the castle features a ballroom and faux fireplace. The Brick Blogger, a blog run by a Lego afficionado, offers some insightful thoughts on this castle. His review focuses on castle design, such as an open floor plan. The advantage of an open floor plan is that you can add items without them getting in the way or causing overcrowding in rooms. It gives your child more room to play. One of the drawbacks he mentions is the bulkiness of the swing that comes with the set. He explains that while bulky parts are a necessity for it to work properly, the parts are a bit ugly and awkward. The castle takes about two hours to build. It might be a little too easy to put together for older kids. There are lots of interior details and secret surprises in each room. Everything is numbered, easy to organize and easy to build. 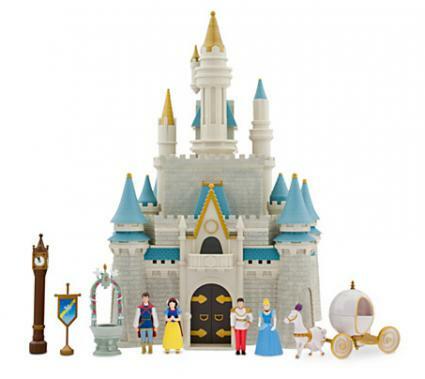 Disney's mini castle playset is a good choice if you need a toy to take on the go or your child loves pocket-sized toys. Because some of the pieces are small, the set does have a recommendation for ages three and up. Be aware that the set may present choking hazards, so if you have children under three in your household, you may want to choose one with larger pieces. The cost of this set is about $17. Kids will love the sparkling turrets and enjoy helping Cinderella's fairy godmother as she creates a magical night of dancing and romance for Cinderella. The tiny turret opens up and all the small pieces can be stored inside for easy transportation. The figurines do not fit inside, however. It also has a jeweled carrying handle. The castle is 5.5 inches high. Cinderella is 3.25 inches high and Prince Charming is 3.5 inches high. This toy does not yet have consumer reviews as it is a fairly new item. However, Google users give the store a 4 plus star rating out of 5 overall. DisneyStore.com has a 30-day return policy if you aren't happy with one of their toys. You can also go directly to any brick and mortar Disney Store location to return or exchange merchandise. Top Ten Reviews gives the Disney Store 7.8 out of 10, stating that there is a "vast selection of toys" on the site. They are rated 7.9 points out of 10 on help and support and a 9.1 on the ease of payment and shipping as well as their return process. 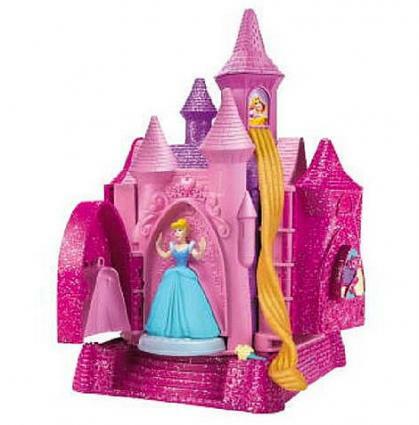 Play-Doh's Prettiest Princess Castle playset will provide hours of fun and entertainment to any child with a creative streak. 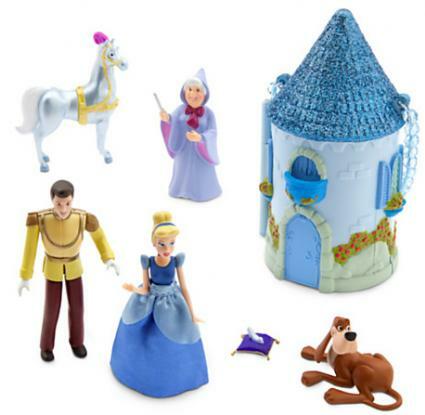 The set comes with several Disney princesses, so Cinderella can interact with her princess friends. This castle is priced just under $35. Each figure has a "door" mold on the castle. Place her in her doorway, add dough compound and create an amazing dress for the princess. Children can also create accessories, such as shoes and tiaras. Everything is stored inside the carrying case/castle, so it is easy to carry from one location to the next. The top of the tower has a feature that allows your child to add the Play-Doh compound and press out Rapunzel's hair in a long strand to the ground. You can even press out a prince figurine with one of the molds. The product weighs just under three pounds and is recommended for ages three and up. Hasbro does warn that while Play-Doh is non-toxic, it contains wheat. Those who purchased this playset for their children are, overall, very pleased with the toy. It has four out of five stars on the ToysRUs website with comments about it being perfect for "imaginative play" and indications that children will play with this toy for hours. 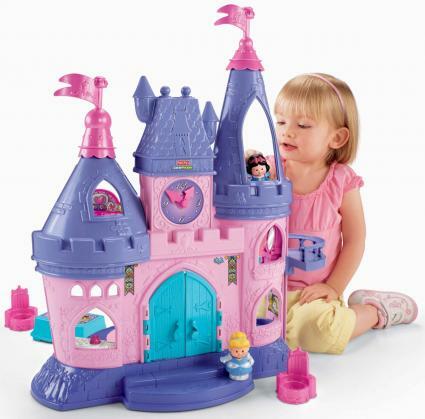 This playset is modeled after the castle located at Disneyworld in Florida. The playset closes for easy storage or opens up for two stories' worth of castle play. It is the perfect setup for a pretend royal ball as it comes with 10 poseable Disney prince and princess figurines. This expansive set retails for about $90. In addition to all the pieces and removable sections that come with this playset, it has working lights and features that recreate a fireworks show. The castle measures 17.5 inches high by 11 inches wide by 12 inches deep when closed. The castle does have small pieces, so this toy is not for children under three or households with toddlers. While reviews on the Disney Store website were mixed, the castle is still worth the money for a girl who loves Disney princesses for the sheer number of features and figurines included. More than 100 reviews for the toy included comments such as that the castle is beautiful, one woman's daughter still loves it after several months, and one reviewer from the UK felt it was good quality. However, at the other end of the spectrum, some reviewers felt the dolls had "creepy" faces and that for the money the castle was not as well made as they expected. The bottom line is that this playset is probably best suited for children over five or those who are gentle with toys, as it has many removable pieces that could be broken if handled roughly. It may well be worth buying for a little girl who loves Disney because of the number of figurines, accessories and special features that will provide hours of play. This amazing play set is perfect for younger children, with the recommended ages at one and a half years old up to five or six (many children will play with Fisher Price toys far past that age, though). The playset is made for little hands and has chubby figurines that are easy to grasp and move around from room to room of the castle. An elevator will transport the princesses to the castle's balcony. This set costs about $50. This playset comes with many features, such as a teapot that whistles when pressed and trumpet fanfare when the front door is opened. The toy measures 19 inches long by 13.5 inches wide by 24.6 inches high. Those who purchased this toy rated it 4.4 out of 5 stars on Walmart.com. Negatives included the cost, and that it was difficult to assemble. Positives included that there were no small pieces along with the sheer fun of the castle with the songs, phrases and other interactive features. If you have a child who loves princesses, castles, and pretend play, then a Cinderella castle playset may be the perfect gift. Remember that many of the playsets have small pieces that could pose a choking hazard and should not be purchased for children under the age of four or five. For a younger child you may want to consider a sturdier castle without small pieces, like the Fisher Price option.